Elizabeth Ann's Recipe Box: CSN GIVEAWAY! CSN has kindly approached me and has offered to host a giveaway on Elizabeth Ann's Recipe Box! The best thing about the CSN website is that they sell a variety of different items: cookware, recipe books, and you can even buy a dining room table. I could seriously live up to my nickname while on this site. . .
My friend, Katie, does a lot of her shopping on their website and raves about the customer service and the website being user friendly. I spent a while looking at http://www.cookware.com/ last night and literally could NOT STOP. . . ugg. . . my Christmas list is filling up. . . AND Nate and I JUST got married, so I have a TON of kitchen "tools". . . but there is so much more that I NEED! Ok, back to the giveaway. . . here is how you play. . .
1. 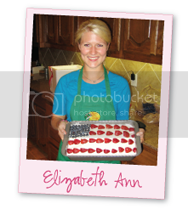 You must be an Elizabeth Ann's Recipe Box follower to be eligible. So, if you haven't yet, just click on that Follow button, or follow me on Facebook (make sure I can contact you through your blog profile or your facebook profile) . . .
3. The giveaway closes on October 31 at midnight!!! I'll post the winner of the $35 gift certificate on November 1st! Good luck and thanks to CSN for the giveaway! LOVE me some hot chocolate!! Any time of year, but especially in the fall! P.S. your blog is presh! I love pumpkin spice coffee with caramel. When I was little mom would make hot Dr. Pepper with lemon. Sounds crazy, but good. Zimt Kaffee (cinnamon coffee here in Austria) and sign me up for the giveaway! caramel apple cider makes me smile! A chai tea latte always seems to hit the spot...and of course, I love a little sprinkle of nutmeg to top it off! Spiced warm cider with a touch of brown sugar and cinnamon while sitting by a warm fire with a great book! My new fall obsession, thanks to the Cheesecake Factory, is apple cider with cinnamon and caramel. It is like drinking a warm caramel apple. Very cozy. I love hot chocolate, especially with a dash of chili powder. Yum! i love jasmine green tea, but fall calls for cider! I like to have some warm cider in the fall. I like to have warm tea. I adore hot mexican cocoa with whip cream and dark cocoa shavings! I have what's called colada de avena which is a drink made is oatmeal, cinnamon sticks, brown sugar, and naranjillas. Pumpkin spice latte from Starbucks or chai spice tea from my own kitchen. Both pair well with pumpkin oatmeal cookies! I follow via Google Friends. I like to sip on hot fresh ginger tea. It's great for when you're feeling sick, too. Through Gus' eyes. . .